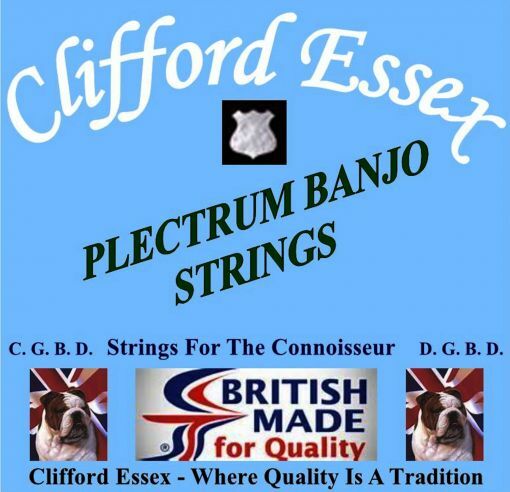 All our plectrum banjo strings have large loop-ends. For wound 3rd and 4th strings we offer nickel or phosphor round wound. The phosphor is bronze in colour and the nickel is gray, both give an excellent tone, and the choice is down to the players personal preference. On each page you will be asked to choose your preference in an options box. We also provide sets with a plain steel 3rd. to the rest of the world £5.00 (airmail), for any amount of strings. String gauges are very subjective. Each banjo player usually experiments with different gauges until they find the right sound and feel to suit their own taste. For general playing a medium gauge set is ideal, although some professional players prefer a heavy set in order to obtain that great big round bass sound. However, we do not recommend heavy sets for the beginner or for use on banjos fitted with a single coordinator rod. Every plectrum banjoist knows just how punishing steel strings can be on the finger tips when you are learning to play. As the skin hardens up the soreness passes but in those early days a light gauge or an ultra light gauge set can help to make practising a little more comfortable. It is important to wipe the length of each string after playing. This will substantially increase the life of your strings and they will retain their great tone. A gradual build up of moisture and grime from the finger tips will shorten the life of the string. For many years I used an old rag with a drop of oil, these days I use 'Fast Fret' because it does a lot more than prolonging the life of the strings. It is a string and neck lubricant, not a spray. It lets your fingers slide freely and is good for wood. Glides on wipes off, specially formulated for stringed instruments. Fast fret cleans strings, lets you play faster, brightens sound, prolongs fingerboard life and protects it, long lasting and won't damage your frets. It also reduces excessive finger noise. Just glide it on with the applicator and wipe it off with the provided lint-free cloth'. PLECTRUM BANJO LIGHT GAUGE. 9 - 22. PLECTRUM BANJO HEAVY GAUGE. 11 - 26.